Researchers also say these interventions are the "easiest to implement" among an ageing population, which has led to rising numbers of frail older people. Frailty is described as the effects of natural ageing combined with the outcomes of several long-term conditions, a loss of fitness and reserves. It is estimated that frailty affects around one in 10 people aged 65 and over, a figure which rises to half of those over 80. In the new study, published in the British Journal of General Practice, researchers from Dublin conducted a systematic review of 46 studies on frailty involving 15,690 people. Interventions examined included exercise programmes, health education, nutrition supplementation, home visits, hormone supplements and counselling. 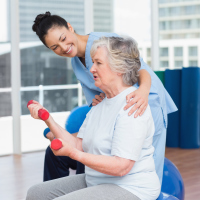 In total, 71% of studies reported an improvement in frailty status following interventions. The authors found that interventions with both muscle strength training and protein supplementation were consistently considered to be the best for effectiveness and ease of implementation. The authors concluded: "Frailty screening is increasingly recommended in primary care and in some cases contractually required, but there is a lack of guidance on interventions once frailty has been identified. "This study outlines both the relative effectiveness and ease of implementation of frailty interventions in primary care, and these findings may help the choice of appropriate primary care interventions." The authors went on to make recommendations for what GPs should advise patients to do, including 20 to 25 minutes of activity, four days per week at home - comprising 15 exercises to strengthen arms and legs and to improve balance and coordination. There should be dietary emphasis on daily milk, eggs, tuna or chicken or, if preferred, formula protein with meals, the authors added. If you're over 65 and looking for insurance options that are right for you, take a look at our dedicated seniors medical insurance and get the right cover for you.